Thrive Themes Coupons? They Don't Exist. Here's A WorkAround. Thrive Themes Discount Coupons? They Don’t Exist. Here’s A WorkAround. If you're looking for the maximum Thrive Themes membership plan discount, you can grab it here! These are the best working deals and step by step procedure to save up to 24% discount off the Thrive themes purchase. Looking for Thrive Themes discounts coupons? They don’t exist, but here’s a workaround. If you’re looking for working Thrive themes coupons, this post (and no other posts on the web) is not for you. If someone claims a working Thrive Themes or Thrive leads discount coupon, they are tricking you. Please Note: Thrive Themes never supports the concept of discounts or coupons. They do not provide any official discount coupons not even for Black Friday or Cyber Monday offers. Having said that, being their trusted and official partner, we bring to you a workaround solution to still save in your Thrive Themes purchase without having to worry about Thrive Themes Discount Coupon Codes. I have been using Thrive themes since quite a time and all I can say is, yes it was worth the investment. Thrive themes have brought conversion optimization to the hands of common bloggers like me who can’t code. They are so easy and have to many easy-to-use tools that collectively work towards increasing your sales or ads clicks or subscribers. I don’t like discussing income reports on the blog but all I can say is, Thrive Themes paid for itself only after 3 months of using it. And more than that, Thrive themes gave me the power to change the look and feel of my site, as I want without having to code or to shell a huge amount to my designer. Like, I saw an element on another blog that looked cool and wanted it for myself, with Thrive, I can do it at midnight ready for readers to see in the morning. It’s that easy! Take a look at my blogging tools and resources page, do you think anyone would be able to do anything close when you don’t know anything of HTML or coding? How To Save Without Thrive Themes Discount Coupon Codes 2018? How To Recover Your Investment On Thrive Themes & Make it Pay For Itself! Please note: Thrive themes does not offer separate promo coupon codes for any customers. Most online stores you find on Google search will show you huge discount on Thrive products and membership plans but when you click them, those will be a waste. As I said, thrive themes have a range of conversion optimization tools that can surprisingly increase your blog sales. Here is a complete list of tools that thrive themes offers as of now. You will also get FREE access to all future additions by them! Get Thrive Architect (Formerly known as Thrive content builder): Create engaging blog posts (check out my Grammarly review to see what it can do to your normal blog posts) and get more sales from them. You can also use Thrive Architect to create high-converting landing pages in minutes. Read my review of Thrive Architect to know more. Click here to get Thrive Architect 2018. Thrive Leads: (Collect emails with popups and content upgrades; Optinmonster (or read OptinMonster review) and leadpages alternative). With the Thrive Leads (explained below) you can not only give away content upgrades but also show exit intent popups and other email generation forms to increase subscribers. you also get thrive leads in this post. Click here to get Thrive Leads discount. Thrive landing pages: If you find creating a landing page something next to impossible, Thrive landing pages makes it easy for you with 152+ editable, drag-and-drop landing pages, optin-pages and sales pages. (Want a Good news? TLP comes free with Thrive Architect! Get Thrive Architect now!) Click here to get Thrive Landing Pages. Thrive clever widgets: To set specific widget for specific blog post. Works great for affiliate marketing and boosting conversions. You get to show a specific widget on a specific post (or two) while other widgets for other posts. Thrive Ultimatum: Adds countdown timers to your sales pages, automatic seasonal offers etc. This boosts the urgency using scarcity marketing technique and hence more clicks and sales. Click here to get Thrive Ultimatum. Thrive ovation: To add professional and stylish testimonials for your sales pages and blogs. Thrive headline optimizer: This one works under the hood and lets you split test article headlines to see what brings more clicks. And yes! 10 highly optimized WordPress Themes (view them) for every niche! These are highly customizable and have apprentice mode inbuilt, meaning you can host online membership sites using the same themes and teach courses etc to paying members! One of their themes is listed as the #1 theme in our ever-updated list of best WordPress Blog Themes. 9) Thrive Optimize: Ever wondered if you could split test your best performing sales pages, optin forms, landing pages by changing color, style and copy to see what’s more effective? With Thrive Optimize, you can A/B split test them to find what version of your page performs the best and converts more. 10) Thrive Comments: This one is my favorite amongst the recent releases of Thrive themes. With Thrive comments (which you also get included in this Thrive themes discount deal), you can form a community of your blog commenters, assign them badges to increase their loyality, show them discount coupons, show them related blog posts as soon as they’ve commented or an optin form to convert them. I’ve written a detailed Thrive comments review where you can read 12 more growth hacks you can do using the thrive comments plugin. Each of this product on average costs around $97 for unlimited usage when bought selectively (around $1000 per year), but if you get the whole membership plan, you get all of these plus all new upcoming plugins for free forever at only $228 per year! Who needs a Thrive Themes Discount Coupon when you can save without them! 1) Go to the official Thrive membership page. 3) Now, the trick to get Thrive discount is, go for the annual plan instead of the quarterly plan. This way you pay $19/mo instead of $25 for the quarterly plan. Clearly you save 24% OFF on Thrive themes purchase with this trick. UPDATE: This trick (the link I have returns an error code. I went to see on web archive it also has the page but now shows error code so clearly they have taken this down) is no longer valid so I don’t think it works. Suppose, you already have bought one or more products separately from the Thrive Themes (for example only the architect or only a single theme) and now you want to buy the whole membership including rest of the products they offer. This section will help you save money in such a case. Now when you visit that page, you see the pricing option for you will be $180 (instead of $228) and $39 for the agency plan users! This is again a clear 21% discount OFF the 24% for new users. So, technically existing users get a whooping discount of 45% of thrive membership plan purchase! If you want to get exclusive discount deals for Thrive leads (email lead generation plugin) you can follow the above tutorial. Since they do not offer new upgrades they do not officially give any festive discounts. However, I have found a trick to get a whooping 85% discount OFF the thrive leads plugin. This works if you only buy a thrive leads copy for 15 websites version, though. So technically we can say save 85% off Thrive Leads instead of saying get discount. 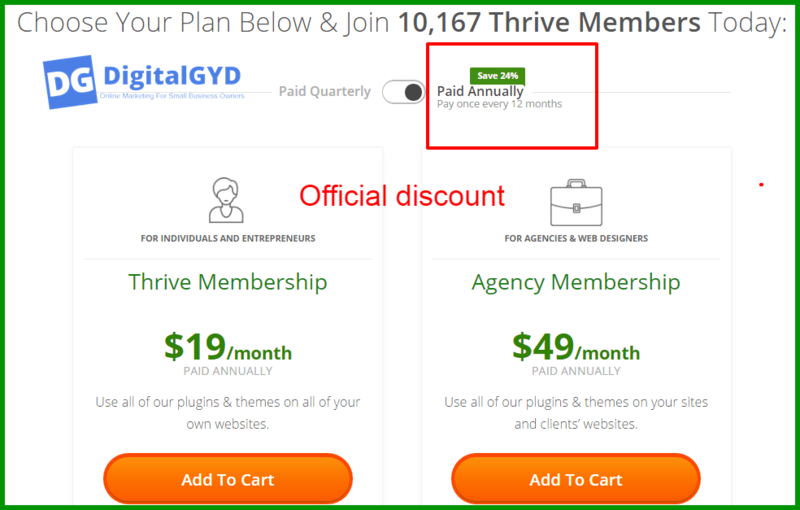 NOTE: This is no official discount, but a workaround which officially gives you the thrive leads plugin with a 85% saving if bought for 15 website versions. Similarly, you can also get a saving of 85% off thrive architect plugin buy purchasing a collective license of 15 websites than a single license. To know the full trick read the thrive leads discount trick in the above point. Thrive architect not only increases your affiliate sales (it does for me (tested and proven)) by helping you design very stylish yet conversion optimized elements like CTA, content boxes, pros and cons box, pricing tables, responsive tables, guarantee boxes and lots more right within your WordPress editor. Similarly, it also comes with Thrive landing pages with which you can create stunning landing pages and homepages that are designed to convert without having to touch a single line of code. Read my detailed Thrive Architect Review to know more. NOTE: If you have only one site, these might not be suitable but if you are looking to be versatile and have more than 1 website/blog in the near future this is the most feasible plan. Take it before the offer ceases because you never know when you will find that one idea which needs one more website and grow your business. Now after the interesting and lucrative saving on Thrive Themes Membership plans, here is how I made my Thrive themes investment pay for itself and recovered the amount in less than 90 days of the purchase. You can use this strategies to recover your own investment in thrive membership plan and then earn passive income off it! After signing up your plan, click here to become an affiliate of thrive themes. Let your readers know that your site is powered by this conversion optimized tool. Mention it at the blog footer and include your own affiliate link there. Include a resource or toolbox page on your site. This is where your fellow bloggers and other newbies will be looking for the tools you use on your site so that they can use them on theirs and grow their blog. Check my resources page to see how to build one! (I used thrive architect to design that page without a single line of coding). Mention thrive products (with your affiliate links of course!) anywhere you find appropriate in your blog, like pages, new articles and even popular old articles. With this I hope you purchased a whole range of conversion optimized tools that can give a boost to your blog’s performance. You’d be surprised to know that Thrive themes have many hidden features that can pay for themselves. Like, the auto image-compression mode. You don’t have to compress any image before uploading to WordPress editor. Thrive themes come with integrated kraken.io engine which means you get image compression for free. This one auto compresses HD images without quality loss! So that your pages are lightweight and have less page load time. I specifically recommend this if you’re using a site that has a lot of images in each blog post. Other thing is you can create membership sites using the same site and theme but only for paid users! See it in action here! So, I hope you don’t miss the once-in-a-year chance of Thrive Themes savings with the above trick. Go for it, try it, use it and make your blog even more conversion optimized. Because you deserve to get better results for your hard-work! If these Thrive Themes saving hack helped you a bit, We’d appreciate if you could share it on your favorite social media platform. If you're looking for the maximum Thrive Themes membership plan discount, you can grab it here! These are the best working deals and step by step procedure to save up to 24% discount off the Thrive themes purchase. I personally use thrive themes and its plugins. It has been more than three months on thrive, already having a great experience. It is easy to use, has a faster load, designed for readership. And this offer can help any bloggers of any niche to take to next level. There are many theme providers and in the past years, Thrive Themes have gained the popularity. It’s good to provide the coupon for the people. Sometimes, the people want more to buy a new theme for their blog. Every Thrive theme can build based on Thrive content builder. The page with thrive content builder we are editing looks like the page of our visitor sees. With this drag & drop plugin, we can create any kind of layout with live preview on the front-end. To customize the size, color, style and many other buttons. Adding a stylish pricing table is easy. Thrive Leads to help us to build our email list faster than ever.Thrive Landing Pages gives us to access to landing page templates that are designed to convert. Eventually, thanks for sharing much informative information regarding this subject. Hey Swadhin, nice trick mate, well observed. Opting into the annual membership at Thrive saves you a nice little packet. And it’s a very rewarding membership as well. Thrive are truly amazing, if it wasn’t for their awesome tools I wouldn’t be in business today. I’ve used all of their tools and my favourite by far has to be Thrive Leads and the Scarcity Marketing plugin. If anyone is thinking about building a great blog or online business, I would absolutely recommend Thrive. Have a great rest of the week mate.